Dark Web, also known as ‘Darknet’, denotes an encrypted portion of the internet which is not indexed by search engines (i.e. It cannot be found in SERP (Search Engine Result Pages)) and which can only be accessed through specific softwares, configurations, or authorization over the internet. Dark Web is a subset of the ‘Deep Web’. ‘Deep Webs’ are not indexed by search engines but can be accessed by someone who knows the URL, through a browser. Dark Web can also be told as an ‘Overlay network’, which is a computer network built over another network and need authorization to be accessed. Peer-to-peer network (P2P network) is a computer networking architecture between peers, which are equally privileged as well as potent. Friend-to-friend network (F2F network) is a P2P network where users can make connections with whom they know, authenticated through passwords or digital signatures. Various P2P and F2F networks like Tor, Freenet, I2P, Riffle, etc. are examples of Dark Web. Dark Web is often portrayed as a domain for criminal purposes. But in reality, it is largely created and used by people who require privacy for legal (like protection of business information) as well as privacy reasons. This can be achieved by using connections like ‘Overlay Networks’, which is a dark web computer network built over another network and which need authorization for access. The anonymity it provides has led to darker web’s negative publicity for cybercrime and related activities. But worldwide, governments and authorities have been taking action against dark web crimes. Law enforcement by Europol along with other six countries to shut down two of the largest dark web markets and collect information on its vendors as well users in July 2017 is an example of the same. As per facts, SERP has been done to only less than 1% of actual content on the internet, and this indexable content is known as ‘clear net’ or ‘surface web’. 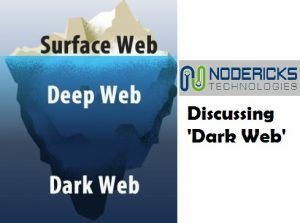 Altogether, the dark web can be defined as an umbrella term to denote the encrypted portion (which is purposefully not public and needs authorization for access) of the internet.